Hydraulic punching head and a diffusion-cooled TCF 1 laser. TRUMPF, represented in Australia by Headland Machinery , has released the Trumatic 3000 Laserpress. The fabrication of complex interior and exterior contours quickly and of with high quality is only possible with a laser. Punching technology’s core strengths are forming, beading, offsetting and tapping. The system combines the advantages of both processes. It has a hydraulic punching head and a diffusion-cooled TCF 1 laser. 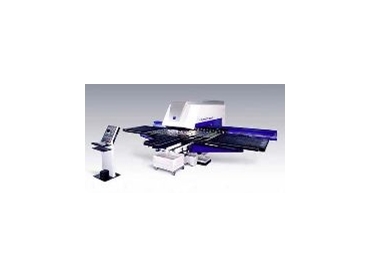 It can process any medium-sized sheet metal up to a thickness of 4mm. The punching head can perform multiple forming tasks. The laser takes over the cutting of the interior and exterior contours. Formed areas, extrusions or threads can be accomplished with the hydraulically-guided ram. The user can select from the Trumpf Multibend or roller tools. Roller technology allows fast, high-quality beading and offsetting. Bending can be performed with the Trumpf Multibend. The integration of consecutive work steps allows work pieces to be processed completely in one clamping. The system has a maximum punch force of 165kN. The acceleration values are comparable to those of other Trumpf punching machines. The linear magazine can handle 19 tools, including the Trumpf Multitool, containing between five and 10 multitools as well as the two clamps. An optional lubrication device can be integrated, reducing wear on the forming tools. Using the same technology as the Trumatic L 2510 2D laser cutting system, the TCF 1 is used as a beam source with the TRUMATIC 3000 L. The 2kW CO2 laser works at high speed in thin sheet metal production. It has a low rate of gas consumption. The premixed gas bottle does not have to be replaced for at least one year. The beam protection sheath has been adjusted in order to cut as closely as possible along shapes up to a height of 25mm. The contact-free process control APC ensures a constant distance between the cutting nozzle and the work piece. After the laser processing of the final contour, the finished work pieces are automatically removed via a 300mm x 500mm parts chute. The Laserpress has a surface area of 45m2. It is equipped with brush tables and optionally with pneumatically-suspended ball rollers around the die. These prevent the sheet metal from any contact with the die during processing and reduce the risk of scratching. The TRUMATIC 3000 L has a touch screen user interface. The system is based on the user interface developed by Trumpf with a Bosch PNC control. Programming is accomplished using the ToPs 300 programming system for punch and combined punch-laser processing. The opening and closing mechanism of the hood covering the punching and laser head is activated via a push button, simplifying the changing of the laser cutting head.